Royal Vista Golf Club offers the very finest in banquet dining and ambiance in a beautiful Country Club atmosphere. Our banquet facility is well suited to accommodate affairs from Business lunches to Anniversaries to Birthdays and Holiday Parties. Special packages for Wedding Receptions, Bar/Bat Mitzvahs, Quinceaneras, Golf Tournaments and School Functions are also available. The grounds provide a rich tapestry of backdrops for picture perfect photo opportunities. Windows surround our banquet rooms hosting magnificent views and the attached veranda overlooks our award winning golf course. Our knowledgeable staffers are very experienced in customizing packages to meet any cultural needs including outside catering. The ceremony site is next to the 8th fairway and green with a waterfall surrounded by tropical palm trees in a selected area of the golf club. 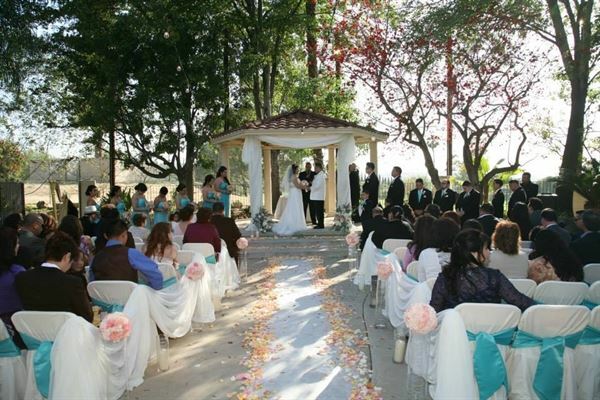 The packages Include: • White folding chairs • A beautiful built in gazebo • A one hour ceremony rehearsal by appointment Rates: Saturday Evening Friday and Sunday • Traditional ceremony package - $800 $600 • Premier ceremony package - $1400 $1000 Please review our attachment for more options. All prices are subject to 21% service charge and current sales tax. The Packages includes: • Complimentary self parking • Cake cutting & serving • Complete set up & clean- up of reception • Uniformed caption, server & bartender • Champagne and sparking cider Rates: • Pearl reception package : $11 per person • Diamond reception package : $16 per person • Royal reception package : $27 per person • Grand royal reception package : $45 per person Please review our attachment for more options. All prices are subject to a 21% service charge and current sales tax. All entrees are served with French Fries and Fruit. The package includes: • All Beef Hot Dog • Hamburger • Macaroni & Cheese Please review our attachment for more options. The buffets served with: • Choice of house salad bar or Caesar salad • Coffee • Decaf & iced tea Rates: • Italian buffet : $22.95 per person • BBQ buffet : $26.95 per person • Mexican station : $24.95 per person • The international buffet : $45 per person Please review our attachment for more options. The Following entrees are served with our house salad or caesar salad, choice of rice or potatoes, seasonal fresh vegetables, fresh baked rolls, coffee and idea tea. • Boneless Breast Of Chicken : Lunch $20.95, Dinner $24.95 per person • Stuffed Breast Of Chicken Florentine : Lunch $22.95, Dinner $26.95 per person • Chicken Cordon Bleu : Lunch $22.95, Dinner $26.95 per person • Chicken Provencale : Lunch $22.95, Dinner $26.95 per person • Broiled Tre-tip : Lunch $22.95, Dinner $26.95 per person • Grilled Beef Brochette & Breast Of Chicken : Lunch $23.95, Dinner $27.95 per person • Choice New York Steak : Lunch $24.95, Dinner $28.95 per person • Duet Of Filet Mignon And Chicken : Lunch $28.95, Dinner $32.95 per person • Surf And Turf : Lunch $30.95, Dinner $34.95 per person Please review our attachment for more options. We enjoyed the golf course and the staff. Everyone was extremely helpful especially with our elderly and handicapped guests. They were extremely flexible and made our every wish come true. I didn't find one person from the bartenders to the banquet staff to the coordinators who wasn't gracious, hard-working, and polite. Thank you for making our wedding the greatest day of our lives!